I love this comic! Whoops, I spoiled the review early, but I honestly cannot contain my excitement. Jupiter Jet is an absolute blast, one that had me (figuratively) madly flipping the pages from beginning to end. Jupiter Jet follows a sixteen-year-old girl named Jacky who, with the use of an awesome jetpack, steals money from criminals and kicks some major tail, all while trying to save her family’s shop. From a plot perspective, Jupiter Jet is such a fun read. It’s a simple enough tale to follow, with Jacky trying to make ends meet and save her father’s shop using her jetpack and her “Flying Girl” moniker. 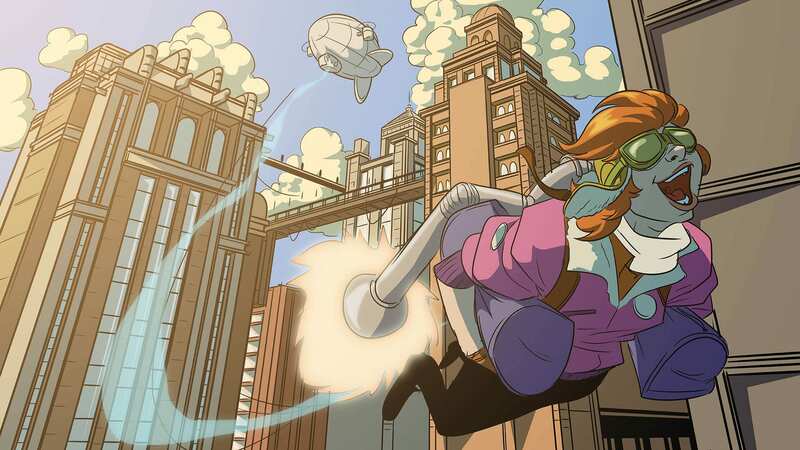 The story takes some twists – one of which REALLY threw me through a loop towards the end – and in between the major portions of the issues, we get a look at how the jetpack was built by her father. The world building in this first trade is excellent, as it shows that there are oppressive dictators in the comic’s universe and a resistance rising up to meet them, a-la Star Wars. And we learn a respectable amount about both sides as the issues roll on; we learn the villain’s motives, and we learn a ton about Jacky and her brother Charles. Not everything is what it seems, and not everyone is what you think they are. That being said, the story never gets too dark. It’s not without stakes, but there’s a real sense of fun and entertainment to go along with the tension. I got a little bit of a Rocketeer flavor from Jupiter Jet, and that’s most certainly a good thing. The artwork by Ben Matsuya really supports the tone of the story. I wouldn’t call it cartoonish, and I wouldn’t call it realistic either; I’d put it more in the “stylized” category. Jupiter Jet really plays at classic action comics, with the real world melding with sci-fi. The stylized art style makes the book feel like a pulpy adventure crossed with maybe a tinge of Saturday morning cartoons in the best possible ways. Characters are really expressive, their designs are beautiful and well realized, and the world painted around them is an oddly inviting one. The action scenes are depicted in a very clear and coherent manner, and the sense of emotion from these characters is palpable. The coloring is also really vivid, also in keeping with the fun tone of the piece. I have to say that I really loved each character in the book, and their interactions are great, but my favorites have to be Jacky and Chuck. Their relationship and chemistry are fantastic, and as a younger brother myself, I totally relate to them. There are a couple of moments in the book where I found myself becoming teary-eyed by some of their exchanges. In just five chapters, Inman and Robinson really got me invested in those two characters. They also filled out the supporting cast – which is REALLY diverse – very nicely. Clara is the cute old lady who seems to be much more unknowing than she really is, and some reveals later on really make her an even cooler character. The flashback portions give us a good look at Jacky’s parents and her uncle, informing the present while also allowing us to get attached to these people. The villain is really fun as well; Praetor Pluto is an intimidating force, and he’s shown to have quite an effect on people. When he walks into frame, he’s met with fear and apprehension. Character’s make fun of his name, but the writers and artist never depict him as a straight up joke, which keeps him intimidating while he remains a fun presence. His face off with Jacky is badass and full of tension, as well as pure entertainment. Are his plans kind of par for the course with comic book villains? Yes, but at the same time they’re really in keeping with the spirit of the comic. Now I want to take a moment to discuss generosity and how it plays into Jupiter Jet. Jacky is shown to be a supremely kind individual, donating some of the money she’s stolen from the bad guys around the city and tipping people in need. This is all money that she could totally be using to pay off her father’s debt, but she isn’t because she cares about helping her neighbor. It’s how she was raised and she doesn’t compromise herself in that. This trait of Jacky’s rolls into a later decision, which I will not spoil, and it makes that choice completely understandable and justified. It’s honestly inspiring, and played in such a matter of fact way that it’s endearing. This is one of my favorite aspects of the book; the thought that kids could pick this up and look at Jupiter Jet as a generous person, and see her evolve from this Robin Hood-esque figure into a legitimate superhero is also powerful. It shows that you are given choices in your life that will define you, and picking the right one – becoming the right person – is crucial. Where does Jupiter Jet go from here? Honestly, I don’t really know, but I do know that as soon as it hits store shelves, I’m 100% going to buy it to see where this story takes its wonderful hero. Jupiter Jet is one of the most purely enjoyable comics I have ever read. It’s full of wonder, hard-hitting action, and a great cast of characters. I’ve already pre-ordered the trade paperback and am eagerly awaiting its arrival. So, if you haven’t picked up your copy of Jupiter Jet yet, do so ASAP. It’s on sale now, and it needs your support. Jupiter Jet is one of the most purely enjoyable comics I have ever read. It’s full of wonder, hard-hitting action, and a great cast of characters. I’ve already pre-ordered the trade paperback and am eagerly awaiting its arrival. Read Call of Duty: Black Ops 4 Tie-In Comics for Free!